As Slayden Plumbing & Heating, Inc. has developed over the years, they also continue to prevail in their industry and have established a lasting relationship with the community and their customers. SPHI mainly focuses on commercial, civil, state, and private jobs throughout the state of Alaska. Phase I entails construction of mechanical, HVAC, and utilities for 129 replacement units in both tri-plex and four-plex building arrangements. New development of the Galaxy Heights and Ravens Wood neighborhoods also include production of the utilidor and utiliduct distribution systems for water, sewer, steam, condensate and glycol and HVAC. Utilidor systems also included replacement of the utility services within an existing utilidor main. This design/build project includes the construction of mechanical, HVAC, and utilities for 90 new military family housing units in tri-plex and four-plex building arrangements within the Eielson Galaxy Heights neighborhood. The new four bedroom units are slab-on-grade configurations which have radiant floor heating in the ground floor slabs. This project also includes renovation of 25 buildings in the Eielson Broadway and Galaxy Heights neighborhoods consisting of 99 military family housing units. Phase III consists of the mechanical, HVAC and utility construction for 54 replacement multifamily housing units in tri-plex and four-plex building configurations. The new units are a mix of two bedroom and four bedroom units for junior enlisted (JNCO), slab-on-grade arrangements which have radiant floor heating in the ground floor slabs. Phase IV includes construction of 76 replacement military housing units in tri-plex and four-plex building configurations in the Eielson Century Park North and Galaxy Heights neighborhoods. The new units consist of two bedroom and four bedroom units for both junior enlisted (JNCO) and senior enlisted (SNCO), slab-on-grade arrangements which have radiant floor heating in the ground floor slabs. Beginning in 2007 on the Ft. Wainwright Army Base in Fairbanks, Alaska and was completed in 2009. It included construction of 200 new units, installation of storm and sanitary sewer systems, 1,200 feet of steam and condensate piping, along with two miles of direct buried glycol heating services. The 300C project was designed to construct the mechanical and HVAC systems for 300C quad facilities. 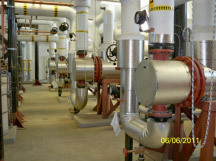 This project involved installation of steam heated glycol systems including direct buried utilities, complete plumbing systems with waste, vent systems, and oil-water separator units. Ventilation systems consisted of two fan rooms and air handling units. In 2010 construction of the Ft. Wainwright Vehicle Maintenance Facility began. The 75,000 sq. ft. project entailed the installation of steam heated glycol systems, plumbing systems including drain waste and an oil-water separator unit. 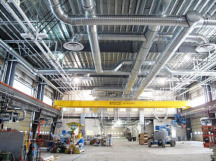 Roof drains, piping systems, compressed air systems, vehicle lubrication, and complete ventilation systems using rooftop air handling units, along with vehicle exhaust systems were completed. Construction of the 265 Warrior-In-Transition Complex began in May of 2010 and consists of an eighty person Barracks, Soldier and Family Assistance Center, Company Operations Facility, and Battalion Headquarters. 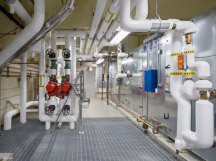 Sanitary waste & vent, fuel, heating & cooling, snowmelt, ventilation, and humidification systems are among the Mechanical and HVAC specifications. Project requirements are being finished in adherence to LEED conditions. See our video spotlight from the May issue of PHC News plumbing + hydronic contractor magazine.